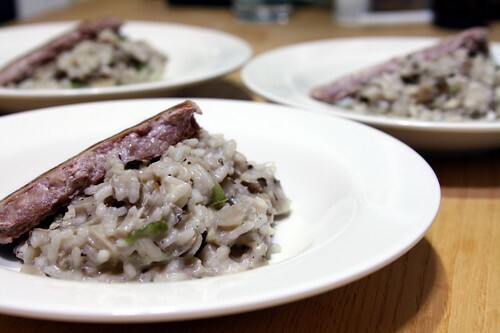 light hen of the woods mushroom risotto with pressed italian sausage, originally uploaded by aarn! +13th October, 2009+. rinsed well and chopped a 1-lb hen of the woods mushroom (parker farm). sauteed the chopped mushroom in 2T. of butter, with a pinch of salt and coarse ground black pepper, until tender (about 15-min), then added 3-cloves of garlic which had been crushed in a mortar and pestle with 1.5t. of caraway seed, and a diced half of a green pepper (wasn't planning on making risotto initially, so this seems kind of out of place in retrospect, but it added some nice flavor and color, regardless of the vision). simmered for a bit with a touch of sherry, then added 1c. of dry risotto. slowly added boiling water from a hot kettle on the stove until the risotto was the right consistency, then mixed in 1/3c. of low-moisture whole milk mozarella, and approximately 1.5oz of plain goat cheese (chevre). lightly simmered until the dish was holding together properly. served on a warm plate with a slice of sweet italian sausage (stillman farm), which had been pressed on a cast iron skillet until nicely browned.